Because of our specialised cooking techniques and equipment, it might be difficult to recreate our signature Peking Restaurant dishes at home. But here's a few of our family recipes that you can easily try out from the comfort of your own kitchen. Follow us on Facebook and Twitter, or sign up to our mailing list for updates and new recipes! With a fantastic array of rich spicy flavours, sweet crunchy textures and soft juicy lychees, this colourful curry is sure to impress your friends and family! Growing up in a Chinese household filled with foodies, the sight of your parents coming back from a Chinatown shopping trip with a couple of roast ducks in hand and a gleeful look on their face was a common one. But after the initial feeding frenzy had ended, there was always the question of what to do with the remaining duck and how else we could further tantalise our tastebuds. This one here's a Mama Kerr recipe, but with a few tweaks of my own that I've developed over the years on how to improve upon the varied textures of the dish. Its a great dish for dinner parties as you can prepare this ahead of time, and you're only using one pot so there's really minimal fuss and clean up afterwards. Put a few spoonfuls of vegetable oil in a large pot and gently fry your cinnamon, star anise, cardamom seeds and curry leaves together to infuse the oil with their flavour. After about a minute, put in your diced onion and fry until golden. At this point, add some cold water to your curry powder and mix it into a paste. If you add the powder directly to the pot, it'll burn! 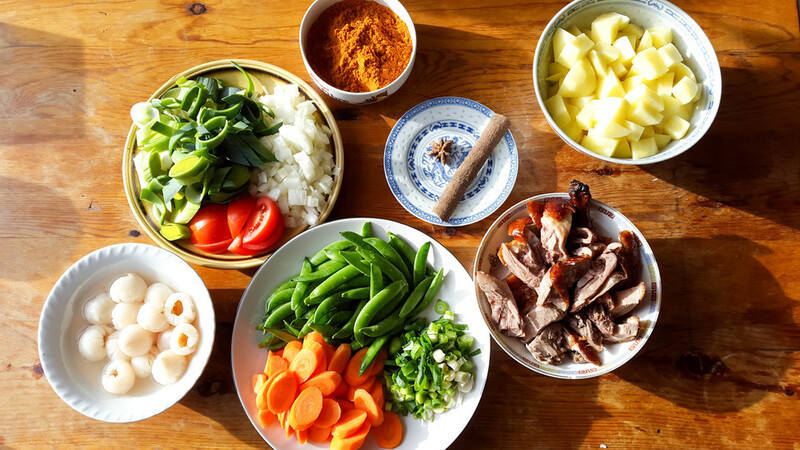 Add your sliced duck and then add your curry paste. Mix well and fry together for a minute or two. Pour in a splash or two of the lychee syrup, not too much as you don't want it too sweet! Pop your diced potatoes and sliced carrots in and then fill the pot with boiling water until it just covers everything. 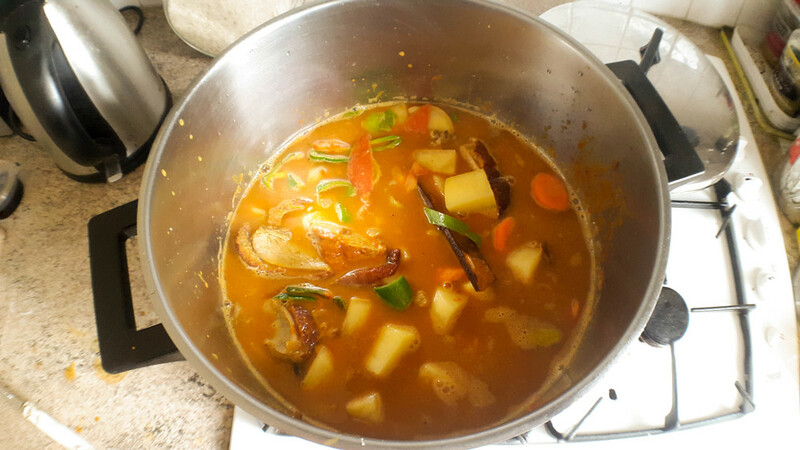 Bring your curry to the boil and then turn down the heat a little and leave it to simmer until the potatoes are soft. Give it a stir now and then to make sure it doesn't burn at the bottom! Add in your soy sauce and then a little salt to taste. Make sure to mix the curry well before adding in more salt, you can always add more later if you feel it's necessary, but you never want to over-salt a dish. Add half a can of the coconut milk to your curry. We add the coconut milk at this point because adding it earlier will cause it to split. 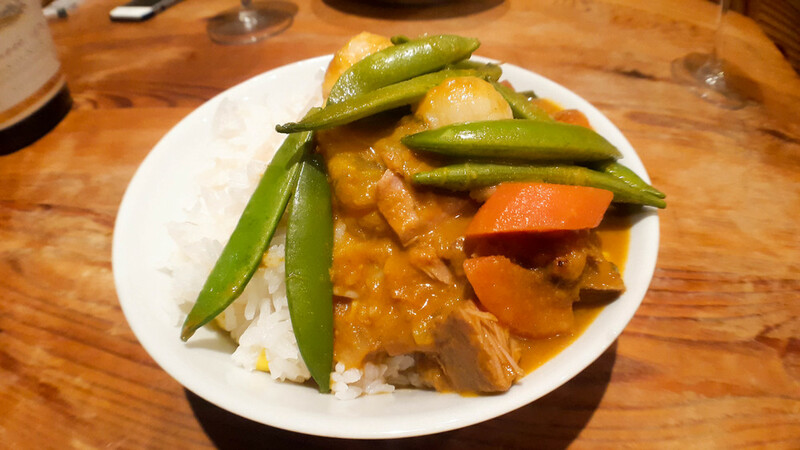 You can always use the remaining can to cook with your rice if you want a truly decadent curry experience, or just save it for another recipe if you want it with plain rice. Now at this point, you've got a choice. You can leave this to settle overnight and then your curry is guaranteed to have an amazing flavour by the next evening. But if you're looking to eat it on the same day, turn the heat off to let it settle, add the lychees into the curry and then layer the spring onions and snowpeas on top to steam for about 10-15 minutes before serving. Adding these ingredients right at the end means that the snowpeas will retain their crunch and the lychees will stay sweet and juicy by the time you eat. 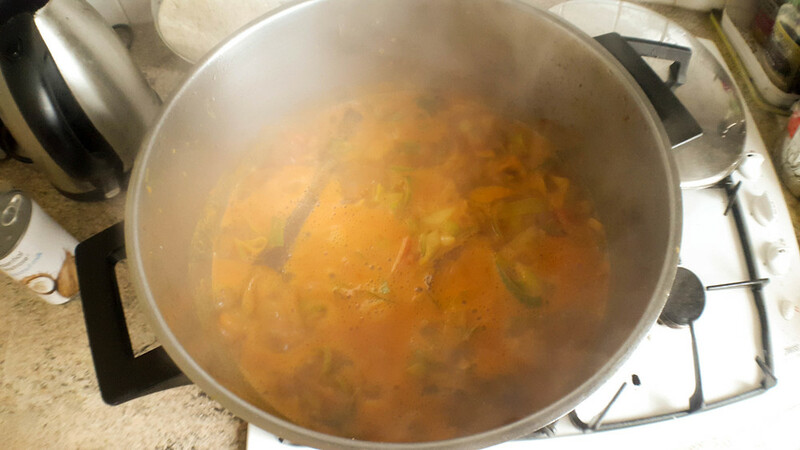 If serving the next day, bring your curry back to boiling and then turn off the heat and add the final ingredients 10-15 minutes before serving. You might want to take a minute to remove the 5 cardamom seeds and the star anise from the pot. They have a really strong flavour and can surprise you if you bite into them. 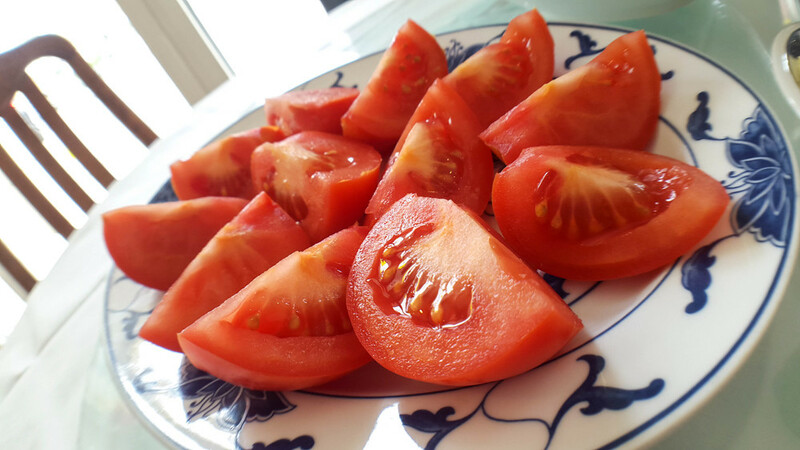 Serve with steamed rice (my personal favourite), but you can also eat this with a naan bread if you prefer. Nice little photo, only I forgot to add the cardamom seeds to the shot before I started cooking. Oops! I started cooking this as the sun was setting, so I felt I managed to get some nice shots in with the light. But it was a bit of a rush to get everything prepared before the sun went down! Frying the spices and then the diced onion until golden brown. I would have added curry leaves too but I didn't realise I had run out at this point. Frying the leeks. 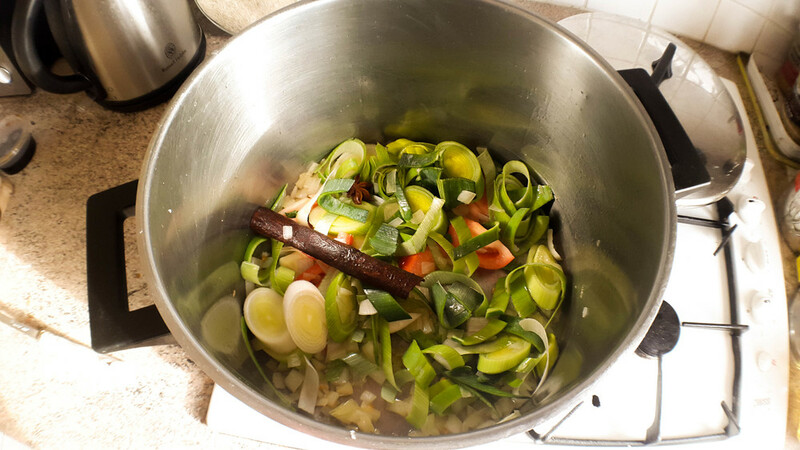 I feel it's always good to add more veg, and leeks add a nice sweetness to a dish. Brought it up to boiling, now to lower the heat and let it simmer until the potatoes are soft. After the potatoes have softened, you can then add in your coconut milk. Add a bit more if you want it less spicy, but try not to use the whole can unless you want this dish REALLY rich! Once you're about to serve, add in the final ingredients to steam lightly for about 10-15 minutes whilst the curry settles. The final product! I'm a bit quirky and I love to add sweetcorn to my rice as it cooks, which you can see from this photo. Purely optional of course, but I love my rice this way. A sour soup is just the thing to help stave off the oncoming summer heat and bring balance to your body. Here's a traditional Hokkien dish my mother used to make for us as the seasons turned and warmer weather approached (and also when we had any duck leftover from my dad's Chinese grocery shopping sprees). Although it can sound a little counter-intuitive drinking hot soup in hot weather, under the principles of traditional Chinese medicine, hot seasons generate an abundance of hot, Yang energy in the body. This excess Yang energy can upset the delicate balance between the heating and cooling humours in the body, which is said to lead to dehydration, restlessness, insomnia and low spirits. However, this imbalance of fiery humours can be combated through eating cooling foods. This philosophy is why this dish is a popular choice amongst the Hokkien speaking community during hotter seasons, as the sour flavours and cooling ingredients in the hot soup are meant to replenish your salt and fluid levels, help boost your appetite, and bring your body back into balance. I love this recipe as it's really very simple, and only a small number of ingredients are needed to make such a beautifully subtle soup. I'm cheating a little bit in this recipe as I'm using a roasted duck instead of from raw, but this way saves a significant amount of time and in my opinion, adds a depth of flavour which I prefer over the more traditional version. This soup acts as a great appetiser, and is also great on it's own with perhaps a little bit of steamed rice on the side. Wash and soak your salted mustard leaves in cold water before prepping anything else to help wash away the excess saltiness. 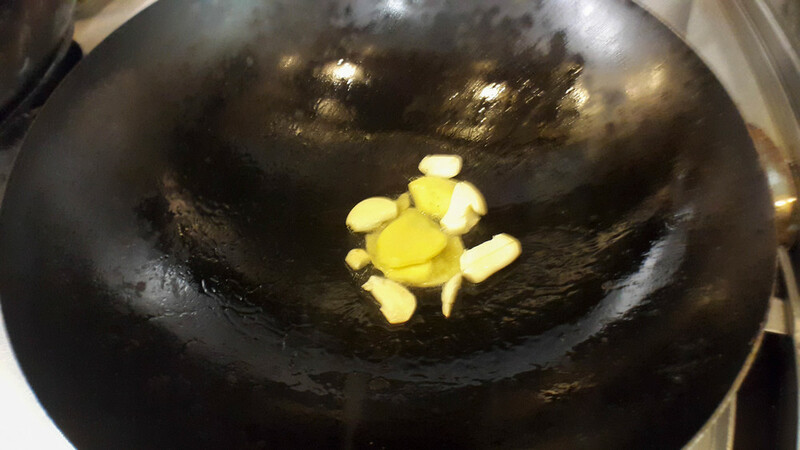 Add a tablespoon of oil into your pot and gently fry your garlic, ginger slices and dried chillies. Pop in your pieces of roast duck and then cover with water and bring to the boil. Throw in your salted plums (The traditional recipe calls for this, and whilst I'll admit it does add some very subtle sweet/sour notes to the soup, it's not a vital ingredient so don't worry if you can't find these at your local Chinese supermarket as they can be a little hard to source). At this point, you can drain your salted mustard leaves and cut them roughly into 2-3cm square pieces and add them to the soup. Bring your soup back up to the boil and then lower the heat and let it simmer for about 45 minutes (although the longer you let it simmer, the better it'll taste). Add a light sprinkle of white pepper (you don't want to overpower the delicate flavours) and add salt and soy sauce to taste. Enjoy it by itself or with white rice. This dish also works as a great appetiser. Half a Chinese Roast Duck. If you read my previous recipe, you'll find some recommendations of where to find the best roast duck in London. Salted Mustard Leaves (Xian Chai) - I'd recommend soaking these in water as you prepare everything else to take out some of the excess salt in the leaves, as the flavour can be a little strong! Once it's bubbling away, add those tomatoes. Then add in the pickled plums (optional) and the chopped salted mustard leaf. Leave it to simmer for around 45 minutes to an hour with the lid on. Then add a dash of white pepper and salt to taste.